to both mother and child. confident her expressed milk is kept safe until needed. The solution from Fairfield is deployed in many hospitals such as the Wirral Women’s Hospital Neonatal unit, the top maternity unit in the North West. It works with barcodes as a technology driver. 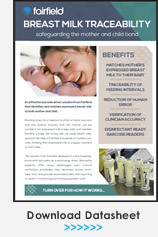 Barcoding systems offer many advantages over manual verification processes; they decrease human error, save time, and provide automated data and reporting to assist in monitoring and increasing patient care.